ControlVM Review 2019: Is ControlVM a Good Hosting? A Malaysian website hosting provider with customers around the world, this company has hosting plans primarily geared towards beginners and new website owners. ControlVM (tagline “Your Solid Hosting Provider) is a Malaysia-based business. Incorporated in 2017, the company has its own Malaysian data center as well as servers colocated in the U.K., U.S., and Singapore. Customers come from more than 40 countries around the world in the U.S., Europe, the Middle East, other Asian countries, and (of course) Malaysia. Their website is provided in English. As already stated in my introduction, ControlVM owns its own data center in Malaysia (which is great for response times to technical issues), and they also colocate servers in Singapore, Europe, the U.S., the U.K., Asia, and the Middle East (which is helpful for international customers). This all means geo-distributed DNS over three continents, for faster DNS propagation. ControlVM’s servers run on CloudLinux, which is known for being a secure and stable operating system, and they use SSD storage for disk read/write speeds of up to ten times faster than traditional hard disk drives. It’s also nice to see that this company’s 99.8% network uptime guarantee is backed by a service level agreement. Looking at the value-added features, ControlVM provides a premium Softaculous installer and a drag-and-drop website builder at no extra cost so that beginners can get set up quickly and easily with minimal technical experience. There are also some useful security features such as Apache SpamAssassin, a free Let’s Encrypt SSL certificate, and CageFS. In terms of advanced features, this provider’s website also mentions PHP, Cloudflare, Perl, Redis, and Node.js. But they don’t go into any more detail. Prices are quite low compared with local and international shared hosting companies, but they’re appropriate for the value-added resources on offer. Most everyday website owners can grab a bargain by sticking with the cheapest plan that comes with 20GB cloud storage, five domains, 200GB monthly data, and a free Let’s Encrypt SSL certificate. Domain registration costs extra. Plans are only offered on annual payment terms, which is not that flexible but is understandable for the low prices. All plans come with a 30-day money-back guarantee so you can sign up relatively risk-free. Support is available by phone, email (to various departments), WhatsApp, and live chat. I contacted the company via live chat when it was offline, but received an email response within minutes that resolved my issue completely and politely. 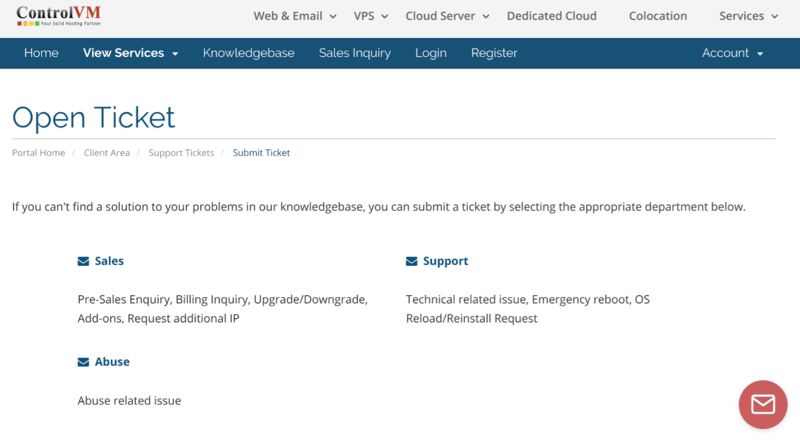 If you can’t find an answer you’re looking for in their online knowledge base, they also invite you to submit a ticket. If you need lots of advanced level features, then this is not the service for you. But if you need good resource levels and some beginner-friendly tools at an affordable price, this company is definitely worth checking out. Wondering how ControlVM stacks up against other Web Hosting companies? Enter any other Web Hosting company and we will give you a side-by-side comparison.